Well, it's been decided: I'm cycling from Copenhagen, Denmark to Germersheim, Germany to attend the SPEZI 2008 'Special Bikes Show' for the April 26-27 weekend. 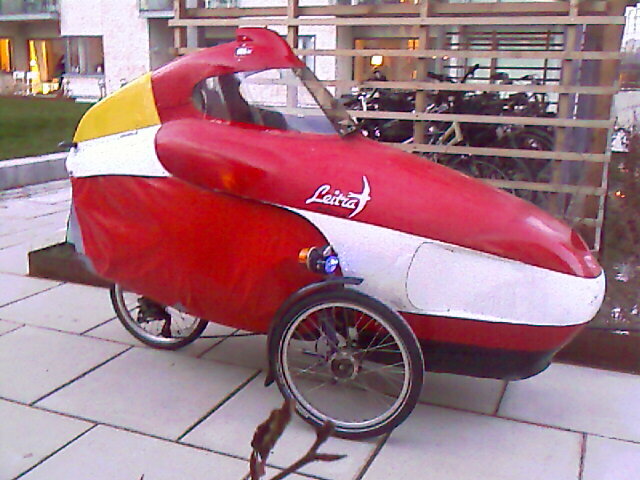 I will be riding in the relative comfort of my 'LeitraTech' (Leitra fairing on an Anthrotech trike - see photo below). The route is about 1,130 KM (about 700 miles) one way. The cow icon below is a link to the proposed route. There will be some changes, most notably the two big climbs towards the end of the trip should be flattened out with alternate routing that I will do 'on-the-fly'. For example, I may head more west towards Duisburg to avoid the tail end of the Harz Mountains before heading south along the Rhein River to my destination. I'll be packing lightly: sleeping bag, clothes for 3-4 days, a few liters of water and fruit juices, and a ground-cover/tarp in case I'm camping under the rain if the LeitraTech is not comfy enough for sleeping in. I thought about carrying a tent, but if the weather is the same as last years at this time, It should be quite comfy to sleep outdoors with just a sleeping bag. Current plan is to head out Sunday morning (April 20) as early as I can, and head for the ferry to Germany, which is about 140 km (about 86 miles) away- a good first day ride to warm me up for the rest of the trip. I'll ride west of Hamburg, stay north of Bremen, and stop on my second day in Oldenburg, my previous hometown. Wednesday, I'll head just west of Osnabruck, then turn west/south-west to Duisburg/Dusseldorf. Thursday should have me on the nice cycle roads along the Rhein River heading south - and upriver - towards Germersheim. If I keep my average speed above 15 km/hour (above 10 mph) I'll be in Germersheim on Friday afternoon/evening. I've been training in the hilly country west of Copenhagen, so I seem to be able to get an 18-20 km/h average on my trips out to the Leitra shop (1.5 hour ride). Such long touring is not a problem for me from the mental standpoint, but the last time I did such a marathon tour was in 2003 and only about half the distance (740 km one way, 1,480 km round-trip) in the same amount of time, so the body is a bit older, a bit fatter, and a bit weaker in the knees (I missed out on a lot of Ultimate Frisbee training during the winter). That is why I'm starting out a day or so earlier than planned - the trike could certainly cruise between 30-50 km/h, but the 'engine' (me) can't do that anymore. Thankfully I'll offset my slower cruising speed by being able to 'stay in the saddle' a lot longer each day. I expect to ride about 10-12 hours a day, which includes a short rest-break every 2 hours or so to stretch, eat, go to the toilet, and do a little sightseeing. Several people from around Europe have already expressed an interest in seeing my conversion kit up close, so they will be expecting me at the show this year. It is also rumored that a forum full of German recumbent cyclists/velomobile enthusiasts are waiting to greet me with cameras and measuring devices when I arrive. It appears that I've stirred up an interest in 'home-built' velomobile projects. Keep an eye on this blog towards the end of the month. I'll be trying to post each day of the trip (or atleast every other day), starting on Sunday the 20th or Monday the 21st. All depends on where and when I get my internet access.